Lawmakers in the State Duma have passed the second reading of legislation banning soldiers from using any electronic recording devices and from talking online about their military service. 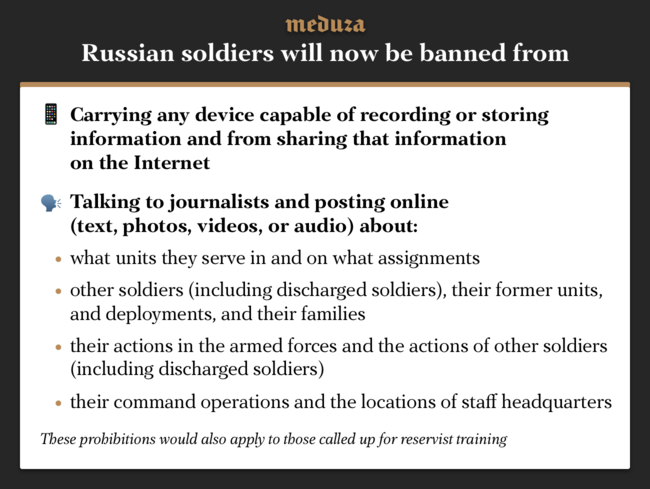 In the bill’s explanatory note, the authors say the law is necessary because soldiers’ posts on social media have allowed investigative journalists to write about the actions of Russian troops in Syria. The legislation would also reduce the information available about fighting in eastern Ukraine, hazing in armed forces, and military training exercises. Read Meduza’s report on this legislation from September 2018.